The Caravan for the Unity of the People and against the Walls of Infamy departed from the city of Oaxaca towards the border with the United States. Organised by the International Observatory for Human Rights of the People, the Caravan will stop in eight Mexican states and is being welcomed by community organisations in from across the country for public events and protests. 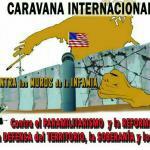 On November 10-12, the Caravan will culminate in a Border Encounter in Nogales, at the border with the US. It will bring together representatives from all over the world for an intercontinental dialogue will take place on the ground as well as through social networks and alternative media. This caravan aims to give voice to the peoples of the Americas against policies of xenophobia, expulsion and discrimination against other communities, proclaimed by the Trump administration. At the same time, it is a manifestation of resistance to all the physical walls that are being imposed, such as Israel’s apartheid Wall against the Palestinian people, or political walls, including ever more racist and repressive migration policies. The Caravan is part of a series of initiatives for a #WorldwithoutWalls that include as well the Mexican-US delegation to Palestine for a World without Walls (October 10-15), various activities during the Global Week of Mobilisation to Stop Corporate Crimes and Impunity (October 23-27), the Border Encounter in Nogales (November 10-12) and the Global Day of Action for a #WorldwithoutWalls (November 9). The Caravan started from Oaxaca, a state in the cross-hairs of corporate interests. Since 2006, Oaxaca has been resisting not only poverty and earthquakes but also the practice of state terrorism, militarization of society and criminalization of protest. On the morning of Sunday 19 June 2016, in broad daylight, Oaxaca was the target of an unconventional, asymmetric war operation by commanders of the Mexican state agencies, which left eleven civilians summarily executed and fifty wounded. This was the moment, when the citizen human rights monitoring effort by the Observatory began. They began networking with popular organizations and simultaneously promoting participatory democracy, the application of justice in the local, national and international levels, building and deepening resistance and rebellion and strengthening of popular power. Due to its geographical location, Oaxaca is today a strategic territory for Mexico’s government projects. Based on the North American Free Trade Agreement (NAFTA) with the United States and Canada, it wants to install the Mesoamerican Initiative and the Plan Mérida, which benefits large transnational corporations and which, with the support of the World Bank and the International Monetary Fund, are designed to plunder natural wealth.